The 6 x 4 Shed-Plus Champion Tongue And Groove Apex Wooden Shed is one of the more high end 6 x 4 sheds that you will see. 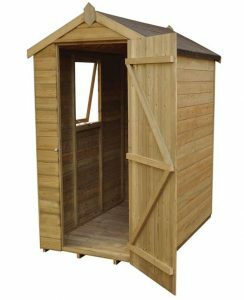 Still, even with the high quality this is a very reasonably priced shed. 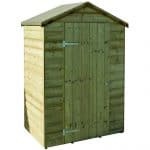 This is one very classic looking shed that is pressure treated to ensure you never have to worry about treating it. They have made sure that you get as much storage space in here as possible by using slightly elevated eaves which give you a little more room at the side of the shed. On the side of the shed is a very well made and smart looking opening window, which we feel will come in handy on those rare hot summers days. It is very impressive just how well made this shed is, considering the price. The walls are made with 12 mm thick tongue and groove cladding which is then supported with a thick and robust frame. Even the roof and floor are solid and impressive. The single door is supported with z framing to make it as strong as the rest of the shed. 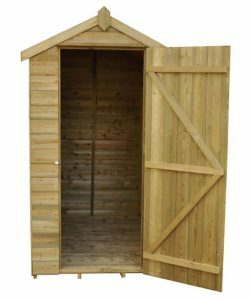 This is one very sturdy shed that thanks to the incredible design and the fact the wood is pressure treated, is going to give you many years of use. Here we have the 6 x 4 Shed-Plus Champion Tongue And Groove Apex Wooden Shed which is one of the more high end 6 X 4 sheds that we have seen in quite some time. 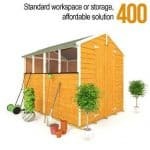 This is compact sized shed, so those with smaller gardens will love how this does not take up a great deal of space. The shed is 5 feet 10 inches deep and 3 feet 9 inches in its width. 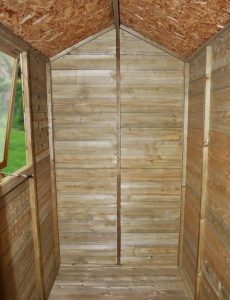 We know this may not sound like a lot of space, but it is as we said a shed that is made for more compact gardens. To help give you that little bit of extra space though, they have used elevated eaves which give you a bit more headroom. Along the ridge the height is 6 feet 9 inches and the eaves is 5 feet 4, which is a couple of inches more than you usually get. It also means you can stack things up a little higher at the sides of the shed. They have used solid sheet boarding for the roof which we admit is not the prettiest boarding out there, but they have at least made sure it is solid by using 12 mm thick boarding. This is going to be nice, strong and able to deal with anything the weather can throw at it. We really like this apex roof and think that the high angle along with the slight overhang will keep what you have in the shed very well protected. 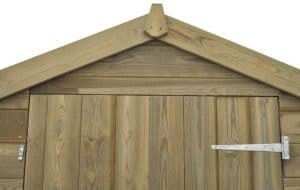 Made from smooth planed timber, the cladding on the 6 x 4 Shed-Plus Champion Tongue And Groove Apex Wooden Shed is very impressive. It is 12 mm thick and as it is tongue and groove shiplap cladding, you will never have any kind of issue of rain getting inside. While the cladding they have used is very practical, we also must say that we love the rather classic and rustic look that it has. Connected to the cladding is a 45 mm x 28 mm frame. You can kind of see it in the pictures, just how solid this frame is. Once installed this is the kind of shed that is going to feel very solid. The kind of shed where if you were to slap it with your hand, you would just have a sore hand, wonder why you did it, but also have an appreciation for just how strong this shed is. The flooring is fully boarded and we love the kind of boarding they have used. It is not actual tongue and groove boarding, but neither is it solid sheet boarding. It kind of falls in the middle and we think that is great. This is very strong flooring so even heavier items will be safe placed on here. The flooring also looks good as it goes very well with the style of the shed. 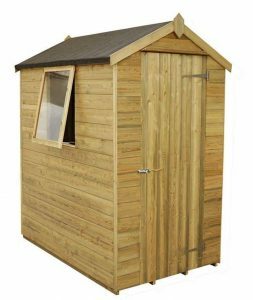 The 6 x 4 Shed-Plus Champion Tongue And Groove Apex Wooden Shed, as the name suggests, is pressure treated. First of all this is fantastic, as it means right from the moment this shed leaves the factory it is set for life and ready to deal with any kind of bad weather. Also it means that you do not have to treat the shed after installation or once a year after. This gives you more time for important things like checking Facebook, watching Sky Sports News or just having a nice cold one straight from the fridge. Due to the pressure treatment process that this shed goes through, you are given a very generous 15 year guarantee. This covers you against things like trot and decay, which as the shed has been pressure treated, should never be an issue. As this is more of a compact shed there is only a single door, but this is a very well made single door. It is made from the same strong wood as the rest of the shed and to ensure it is just as robust as the cladding, frame and other parts of the shed, double z framing has been used. This along with the high quality hinges will make the door feel very solid. At 5 feet 5 inches high and 2 feet 2 inches wide the size of the door is pretty much what you would expect. On one side of the 6 x 4 Shed-Plus Champion Tongue And Groove Apex Wooden Shed there is a very classy looking window. This is an opening window that is made from strong acrylic glazing. We like how they have gone that extra mile of not just putting a window on here, but also ensuring that it opens. As an actual shed, this is one of the most solidly made 6 x 4 sheds we have seen. It is just incredibly robust. If there was a zombie apocalypse, this would be a great place to hide. But being serious, that single door is kept securely closed with a pad bolt. We like how they included a pad bolt instead of just a turn button catch, as this makes it much easier for you to add a padlock at a later date. While there is a window on one side of the shed, we do not feel that lack of privacy is an issue with this shed. The window is not the largest, so you do not have to worry about people being able to see in easily. The 6 x 4 Shed-Plus Champion Tongue And Groove Apex Wooden Shed does not actually offer any customisation options, but if for some crazy reason you do not like the charming classic look this shed has, you could always paint it. Just make sure you use a paint that is not going to damage the wood. They have offered a few extras with this shed. The most notable and practical ones are the security options. For £19.99 they have a Security Alarm Padlock, but for a little extra they also have a Yale Security Kit which costs £24.99. We recommend you have a think about one of these if you do plan on keeping more expensive items in the shed. They do also offer an installation service, but at £109.99, we feel it is a little overpriced. This is one of the most impressive 6 x 4 wooden sheds we have seen. They really have done a great job here, especially when you consider how they have managed to keep the price so low. This is one of those sheds that we really can see lasting a lifetime. It is just so well made, plus the fact that it is pressure treated makes it even better. We do not see anything on this shed that is going to cause you any kind of problems as the years go by. 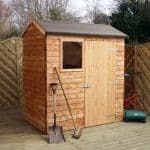 This is a compact sized shed, so if you do have quite a few items then you will have to plan your storage out carefully. As long as you have a friend or at the very least a family member you can tolerate for a few hours, we do not see you having any issues installing this. You are looking at 4-6 hours to get this ready for use. 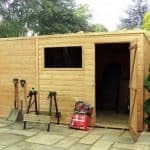 With the impressive materials they have used, we feel that this is a shed which is offering fantastic value for money. 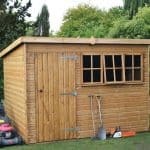 Final Thoughts: The 6 x 4 Shed-Plus Champion Tongue And Groove Apex Wooden Shed is certainly one of the more impressive compact sized sheds that we have seen. That classic looking tongue and groove cladding really is very special. It is made even more special when you consider just how strong the frame is behind it. 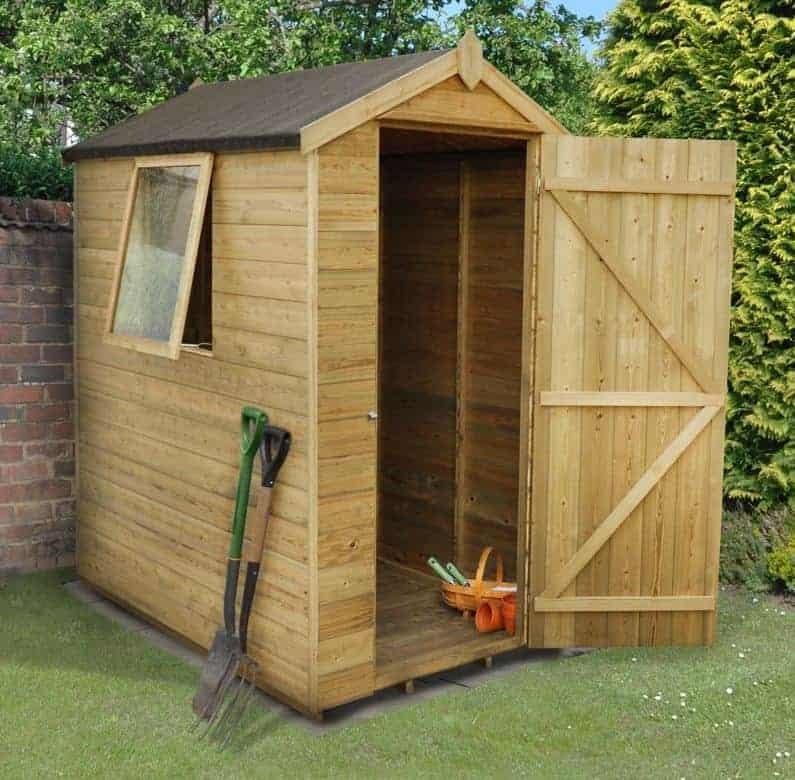 This is a shed that we honestly do not see you having any kind of issues with once you have installed it. 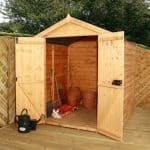 While it may not be offering a whole lot of storage space, if you have a small garden or just need a more compact shed, then this is one we highly recommend you consider.